"Moderation and awareness is key," is the last line of this video. And ultimately it is the same for every auction site, penny or otherwise. I will actually be using QuiBids and will deliver a review after I have had a chance to check it out. Welcome to a new series about penny auctions. 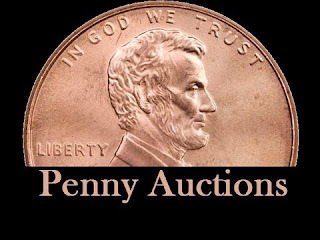 I will be talking about the basics of how penny auctions work and taking you on a tour of some of the most popular penny auction sites over the next several weeks. I hope that when we are done you will have enough information to make an informed decision about whether penny auctions are even right for you, and which site or sites you will decide are the best fit for your auction style. Don't make the mistake of thinking that penny auctions work like eBay. The only part of a penny auction that is slightly like eBay is when a particular penny auction site offers a "Buy It Now" option, and the similarity ends with the name. Not every penny auction site actually offers this option, which I will talk about in a minute. The most significant difference between penny auctions and regular bid auctions is that you have to buy the right to bid! This is accomplished by purchasing credits that you will use to bid. Credits vary in price, but may cost anywhere from 25 cents to 75 cents or more. Many sites offer discounts if you buy packages of bid credits, and others offer a certain number of free bids to get you started. Most penny auction sites start each auction at $0, and every time there is a bid the price of the item goes up by $0.01. Depending on the penny auction site, the the increase in price could be anywhere from $0.01 to 25 cents every time a bid is placed. Every time a new bid is placed, the time remaining in the auction is extended, typically less than 10 to 20 seconds. Some sites will add as many as 30 seconds to the clock and others have turbo features where only 5 seconds is added to the clock. The last bid before the clock runs out wins, just like in a regular auction. After you have won, you can pay immediately and provide your shipping information. Plundr, QuiBids and BidRivals offer a "Buy it Now" option. If you were bidding on an item you wanted badly enough to pay the full retail price, "BuyIt Now" could make sense for you. Some sites will deduct the value of your bids from the total cost of the item, giving you an instant discount. Let's say you bid 25 times on a $100 gift card. Your bids were $0.50 each, so that would be a total of $12.50 that you spent on bidding. In a "Buy It Now" scenario, you could purchase the gift card for $100 - $12.50, for a total of $87.50. With a penny auction, you could win a great item for a tiny price - but be sure you don't forget to include the cost of the bids when figuring how much you really paid. Let's take our example above of the $100 gift card. If you win the $100 gift card for $15, don't forget the 25 times you bid on it that cost you $12.50. That makes the total for your gift card $27.50 - still a fantastic savings, but an expense that is easy to forget about when figuring up your real costs and savings. The best thing you can do for yourself is set a budget that you are willing and able to afford, and then stick to it. Don't bid on things that you don't really want just because they are cheap. It doesn't matter if you saved 75% on an item worth $500 if you cannot actually afford to spend the $125 + bids that you paid. If you create guidelines for yourself and stick to them, you can have great fun and save a boatload of money on products you might not ever consider purchasing otherwise. It is a rare money-making venture on the internet that does not have plenty of articles about it with "scam" in the title. Even the most above-board direct sales company having impeccable management credentials is likely to have at least one Google listing for a "review" written by a disgruntled former distributor that trashes the company, products, management, etc. Still other articles are written about how anyone who ever supported (insert company name here) at any time is a scammer. The person who lost money never considers the possibility that he or she did not have what it takes to run a home business, even part time. While it is true that some are sincerely concerned about how easily people can be scammed on the internet (remind me to tell you about some of my own experiences! ), still others use negative reviews to drive traffic to an article that prominently features a link at the bottom to their latest deal, urging visitors to "Check out a company where you can REALLY make some money!" Puhleeze. How much more, then, are penny auctions going to raise the scam radar of those watchdogs who live and breathe to tell you how you ought to spend your money? Their warnings are not just paranoia. Penny auctions, like penny stocks, are HIGHLY SPECULATIVE. Let me repeat. HIGHLY SPECULATIVE. Even though auctions start at a penny, if you don't know what you are doing, you can find yourself locked in an autobid with someone having deep pockets, and spend way more on an item than you intended to. So what, you may ask? If I planned to bid on a Nikon Camera up to $100, and I end up getting it for $145 instead of $450, why does it matter about a lousy $45? Because penny auctions, like penny stocks, are HIGHLY ADDICTIVE. Let me repeat. HIGHLY ADDICTIVE. Particularly if you start winning. Have you ever turned 50000 shares of PennyStockFool.com at a penny into $2,500, or $5,000, or more? Then you know what I am talking about. The same kind of thing can happen with penny auctions. They produce the same kind of rush as horse racing, or high-stakes casino gambling. Worse still, since you are paying online, it is a little like Monopoly money. You may reason away an extra $2 on an inexpensive item. (What if I lose the item for the want of just $2??) You may reason away an extra $10 on an expensive item that you are paying online with a credit card, but those $10 overages quickly add up to an extra $100, or $200 or $500 if you are not careful. Would you tear up five $20 bills and flush them down the toilet? Of course not. So why is it so easy to whip out a credit card and pay $100 for something you really don't need and are not going to actually turn around and sell on eBay for full price? I know this isn't the information you thought you were going to get in this article, but I wanted you to have a chance to think about whether you have the temperament to bid sensibly on a penny auction before I start talking about penny auctions in earnest. If you have the discipline to play them right, penny auctions can be a lot of fun, and a way to pick up great products at a fraction of their actual cost. If you have what it takes, watch this space Monday for a new series about penny auctions! By now you must have heard about the latest online craze known as Penny Auctions that enables everyday people to buy top brand products at prices way below retail. These switched on buyers are involved in a new way of shopping called Penny Auctions, where bidders strategize and outwit each other to get unbelievable deals and save hundreds or even thousands of dollars off the normal retail price of top label items. So how do Penny Auctions work? A prospective bidder signs up fpr a free account and purchases bids to use in the auctions. The cost to buy bids differs on each Penny Auction site, and is also different for each country. For example, in the US, a bid on a particular Penny Auction site might cost 60 cents, whereas visitors from New Zealand may pay 90 cents per bid. This is due to currency exchange rates. In the end, all visitors pay about the same amount for each bid. For the purpose of simplicity, all figures used here will be in US dollars. Penny Auctions are different from standard auctions in that you do not necessarily bid what you think a particular item is worth. There are several auction formats, but the general idea is to try to bid as late as you can in order to be the top bidder when the countdown timer runs out. The winning bidder then buys the product for the Final Price of the auction, which is often hundreds of dollars below the retail price. Now and then the winning bidder can win a product simply by placing the last bid, and have nothing else to pay to get the product, not even shipping! Auctions start at $0.00, and each bid bumps up the final price by 1 cent. So an auction that receives 50 bids will have a final price of 50 cents. Auctions have a countdown timer, usually set to start at 10 or 20 seconds, depending on the Penny Auction site involved. The timer is bumped up by 10 or 20 seconds respectively each time a bid is placed. So that on an auction that begins with 10 seconds on the clock, if that timer has run down to 4 seconds and a bid is placed, the timer will be bumped back up to 14 seconds, and the countdown will resume from there. The auction ends when the timer reaches zero seconds and no more bids are placed. What happens at the end of a Penny Auction? If you are the leading bidder at the end of a Penny Auction, you generally have two options. 2. OR, you can swap the item for more bids, and then bid for another item. Who is eligible to participate in Penny Auctions? The specific terms and conditions of each Penny Auction site vary, but generally speaking the criteria on each site are pretty much the same. You need to be 18 years old or older and able to legally enter a contract. This is a standard rule for any online auction site. What this means is that if you are 17 years old you may not join, but once you turn 18, you may. Only people living in approved countries may bid. Most Penny Auction websites are only viewable in the counties where participation is allowed, i.e. The USA, Europe, Australia and New Zealand plus others. For various reasons, some countries are currently excluded from most Penny Auction sites. Each Penny Auction site has their own rules for bidding, so make sure you read them prior to signing up. How to Keep Safe When Using Penny Auction Sites. As with any type of internet shopping, it is important to protect yourself when signing up to Penny Auction sites. Only join sites that specifically guarantee that they do not use any automated bidders to manipulate auctions, and also those that do not allow their own employees and their families from bidding in auctions. It is very important to protect yourself against scams. Sticking to the larger sites is the best way to do that. So, next time you are thinking of buying some famous brand products on the internet but are sick of eBay, consider the benefits of using Penny Auction sites, and have some fun while you save hundreds of dollars on great products.